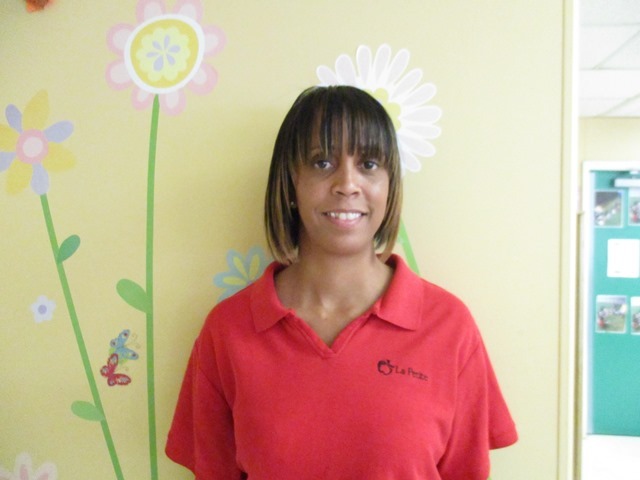 Meet Ms. Denetra, a lead Infant 3 teacher (12-18-month-olds) at our La Petite Academy in Bowie, MD. She has been working in child care since 1996 and has been with the company for 12 years. Read our Q&A to learn more about Ms. Denetra and her love of early education! Why did you decide to take a career in early childhood education? Kids are always happy and always keeping you busy. They keep growing up every day and they keep you on your toes! What is special about teaching in the Infant 3 classroom? At that age, it’s where we start teaching them things like sitting at the table, how to hold a book. It’s lovely when we go outside and they learn about bugs. I’ve always loved kids. These are my babies and I’m looking after them all day. How do you explain our infant curriculum to prospective families? I show them how the lesson plans are prepared for us. I tell them that we do activities that fit the child’s level. If a child is getting frustrated with something, I’ll back off with that type of activity. With infants, it’s hard to have a set schedule. You have to go with the flow of them. What are some types of activities you do with your infants? We’ve had a nature lesson where we go outside and pick up pinecones, acorns and more and then make a collage with it while learning about colors. Can you share an accomplishment you’ve had at La Petite Academy? Watching the kids move on from my classroom and take what they learned from me – that makes me feel good.